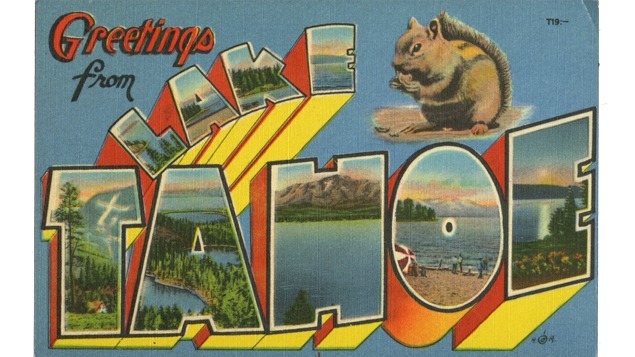 As Lake Tahoe became a popular destination for vacationers and tourists in the early twentieth century, demand for souvenirs and other mass-produced items grew rapidly. Travel photographers and enterprising commercial firms began to cater to an ever-increasing demand for souvenir images. The rise of offset printing and lithography led to the proliferation of printed postcards. Visitors came to Lake Tahoe and the surrounding Sierra to enjoy a variety of recreational activities—including hiking, fishing, horseback riding, swimming, and boating. Increased access via railroad and automobile gave rise to tourism and a vibrant resort culture during the first half of the twentieth century. Just like today, visitors to Lake Tahoe in the early twentieth century, might have purchased postcards to send friends or to keep as personal mementos of their travels. All postcards from the collection of Erik Flippo.